I got a Therion 166 earlier in the week, and spent a lot of time over the last two days trying to get TC to work well. My issue is that I'll put a coil on the mod and open the atomizer analyzer. I'll use the values of my current coil in this example, which fluctuated between .333 and .335. The internal resistance is set to .04, so the cold ohms should be read be ~.330, however the mod sets the cold ohms to .323-.325. I do get a consistent vape, but I have to have the temp set for 500-530 or so, instead of the 400-430 I typically use. It isn't "accurate" and that bothers me. Several times I've let the coil cool for half an hour, re-attach it, and the atomizer analyzer still shows .334 give or take .001, and when I fire it the cold ohms get set to .324 give or take .001 . The issue happens consistently with every attempted build, I'm looking to see how I can figure out why. Could anyone point me in the right direction? Thank you!! i always have to run my SS TC builds above 500F. why does the higher number bother you? if you're getting a good consistent vape i would call it good. most likely the reason you were getting a good vape at 400-430 was do to a high base res (before refinement). then after refinement you're left with a very accurate base res reading. every single SS316 build i have requires 500F and above for the vape i like. maybe i'm missing something but your main complaint is the need for a higher temp setting and cold ohms not matching up, right? 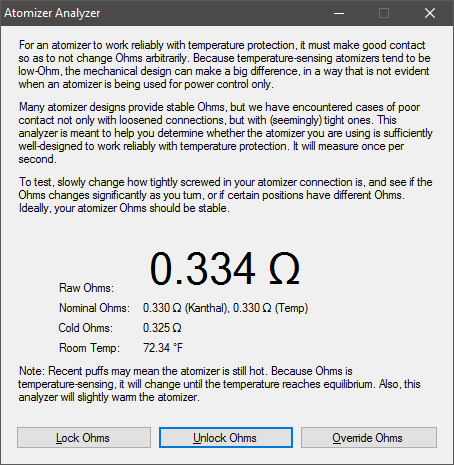 your cold ohms will be lower than "temp ohms" due to case analyzer results and refinement. to add....if you want to run your lower temp settings, you can lock your res as soon as you place on the atty. this will stop refinement from lower your res but your vape won't be as accurate. it's a preference thing. some lock and some don't, each with their own reasons. "maybe i'm missing something but your main complaint is the need for a higher temp setting and cold ohms not matching up, right?" That is the result of the symptom. My main complaint / concern is that I'm worried there may be something wrong with the mod/board because the cold ohms always get set around .010 ohms below what the actual cold ohms are. 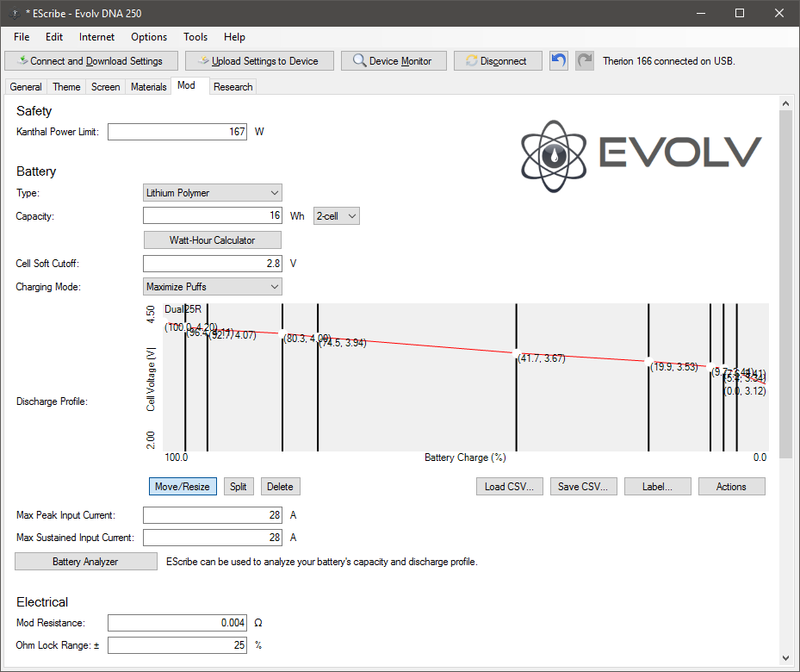 I was hoping something in my eScribe settings would "pop out" as being the obvious problem to someone who knew more about it than I do (I'm only about 1/4 to 1/3 of the way through the online training that is provided by Evolv). I have no problem running the temp higher to get a good vape, I just want to make sure my mod isn't defective in some way. I've had really, really bad luck with mods this last year, which is why I bought the Therion instead of getting yet another mass produced Chinese throw away. TL;DR - The main concern is that I want to make sure nothing is wrong with my mod. It sets the cold ohms lower than it should 100% of the time. The mod is going to read the cold ohms as they are... the Atomizer Analyzer has no play in that...the mod is going to read what is sitting on top of it...Atomizer Analyzer is only going to show you what is being read at that time...raw ohms is the cold ohms plus the internal resistance of the device...the mod resistance set in the 'Mod' tab is to allow the mod to compensate for the internal resistance of the device...all devices are a little different...where did you get the value you have set for the mod resistance? Mod Resistance value is set to .004, as shown in the third picture of my original post. Raw and Nominal are correct. Cold ohms was set to .325 instead of .330 (to my knowledge cold ohms should be equal to nominal ohms when the coil has cooled to room temp). I've repeated this about 10 times with different builds on different atomizers and each time cold ohms are set lower than nominal ohms. .004 for mod resistance is what the default is. I have not reset this for my mod yet, as I don't know how to get the mod's internal resistance value to put into eScribe. I assume it will be covered in the Evolv Training Course that I'm going through, I just haven't gotten to anything covering that yet. To my knowledge (and I could be wrong here), eScribe and the mod will use the settings provided, so even if .004 is wrong for my internal resistance, it should still set Cold Ohms to Nominal Ohms. So if my internal resistance was .007 but set to .004, the mod should still use .004 for nominal / cold ohms. In my case, Nominal Ohms is always .004 below Raw Ohms (as it should be). But Cold Ohms is always about .005 - .006 below Nominal and I have no idea why. I too have a Therion & just checked the factory settings...and that is the factory default, but doesn't mean that is the true mod resistance of your device.. Okay I followed your guide and set my internal resistance to .006 in eScribe. The Cold Ohms and now closer to the Raw Ohms, still not matched, but closer. I also did some experimentation using the Device Monitor. I found a wattage in wattage mode that gives me a good vape, then I put the unit into TC mode and set the wattage to the same that I had in wattage mode, and set the temp to 600 so that TC could not kick in. 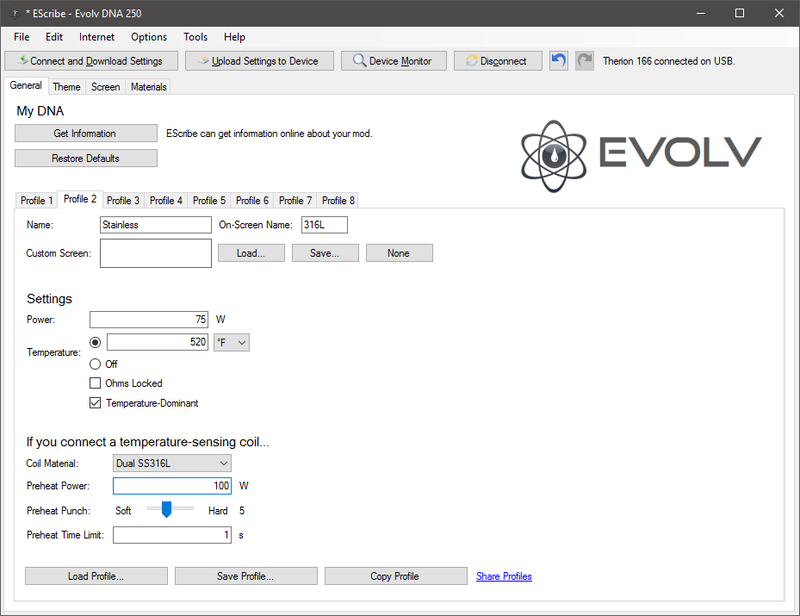 The device monitor showed the temp going up to 500-520 degrees. I've only used the OBS Engine in TC mode on the Therion, but I have used other tanks in TC mode on other mods. 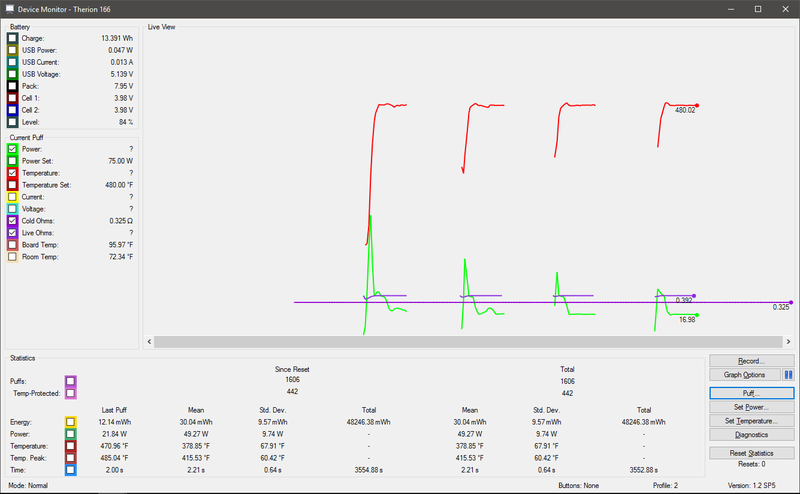 The OBS Engine is top airflow while the others I've used in TC mode in the past are bottom airflow. This leads me to believe that top airflow just needs higher temps to get a good vape. This explains the OBS Engine needed TC set to 500-520 vs the typical 400-430 for tank I've used in the past. Does that make sense or am I incorrect in the top airflow requiring higher temps? Unfortunately I do not have a bottom airflow rebuildable Tank to test this on. Cold Ohms is interpolated to 70° F.
If your cold ohms is lower than your nominal ohms, it means that the DNA thinks the room temperature is warmer than 70°. Thank you for this, it makes a ton of sense. My Therion typically thinks it's warmer than it is by around 10-15 degrees. Currently it thinks that the room temp is 81.3, but the thermostat in this room is set to 68 and is reading 68. I've done the case analyzer which made the mod better at knowing the room temp; the mod does a really good job when it's been sat down for 60+ minutes. After sitting overnight it is typically dead on accurate. However if I'm vaping on it the temp accuracy isn't great. I'm currently playing video games at my PC, and taking a few puffs every 10 minutes or so, and have been for an hour. As I said above, the mod believes the temp is around 13.3 degrees higher than it really is. Refinement is always on the lookout for the lowest calculated resistance for 70°. So if your cold resistance is higher than what it already has locked in, it will just reject it and use the reading it was already using. I think it's fine. Leaving it plugged in will heat the board. The dna will have to guess the room temp based of of the case analyzer calculations.